With 2014 giving us the multi-story, Worlds of Doctor Who set, 2015 gave us a taste of other Big Finish properties in the form of The Worlds of Big Finish. 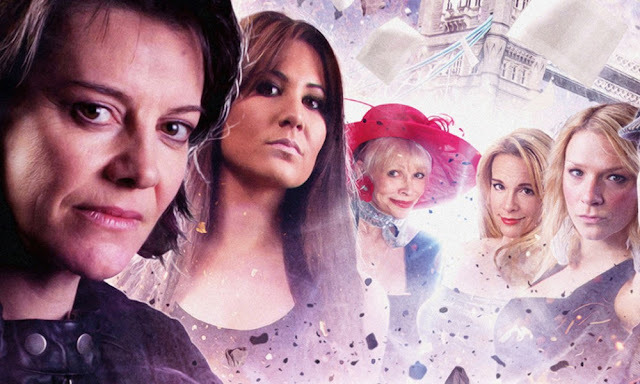 It is a set which don't feature any of the BBC lisenced properties including, Graceless, Sherlock Holmes, Dorian Gray, Iris Wildthyme, Vienna and Bernice Summerfield. All written by David Llewelyn, the set consists of six thirty- minute episodes that follow one long plot. All the stories feature the characters coming into contact with the mysterious book known only as Volume 36,379 of Kronos Vad's History of Earth and as it moves through time there are some connections between the stories. It all kicks off with Graceless in The Archive. I'd heard Graceless before but for those who haven't the Graceless Sisters are living versions of the Key to Time tracers. At will, they can travel anywhere in the universe as well as possessing lots of other powers. Here they arrive in the fabled Archive, where they are quickly drawn into a murder investigation. The Archive is probably the weakest installment of the entire set as much of it is spent walking around talking to libriarians. It did have, however, one particularly creepy sequence, but the culprit was, as is often the problem with the Big Finish stories with small casts, really obvious from our first meeting. Unfortunatly, The Archive wouldn't make someone want to check out the Graceless series which is very enjoyable. Sherlock Holmes is a Big Finish series that I've never sampled, which stars Nicholas Briggs as Holmes. The Case of the Bloomsbury Bomber also features David Warner reprising his role as Mycroft, who is playing the same character he did several years previously for the Bernice Summerfield range. The story is actually pretty decent, even if the motives are a little strange, but I'm not sure what to make of Brigg's Holmes. His voice is so distinctive in everything and it just sounds like him trying to do a silly voice. The Holmes story is picked up pretty quickly in the Dorian Gray adventure featuring a seance gone wrong with The Feast of Magog. There is a lot of praise for The Confessions of Dorian Gray range and I've only ever one free Big Finish story so this was the story I was most looking forward too. But I felt a little disapointed by it. Alexander Valos is fantastic in the title role but the horror themes here are pretty tame. Basically if you've seen or heard any other seance/demonic possestion story, you've heard this one. But it does have some nice crossover elements. I adore the next series, Iris Wildthyme in both her audio adventures, and appearences in her own or Doctor Who prose and Kronos Vad's History of Earth (Vol. 36,379) begins to tie the various plot threads together as Iris and her companion, Captain Turner become embroiled in the filming of a reality television show. There were some nice ties to previous stories in the set and some nice jokes, the one about Cranford being my favourite! Hugh Skinner is a great companion for Iris, I loved Panda but Turner provides a lot of different possibilities for the series. On the whole though, this was a great story even if the ending needed some more oomph than the sound design and direction gave it. I've been on the fence about the Vienna series. I've heard and enjoyed Vienna: Retribution but set during her early years, The Lady from Callisto, isn't bad and it has pursuaded me to revist the early sets at some point. Chase Masterton's bounty hunter chases down a missing person, in a mix of formulaic investigation and hard to believe romance. It isn't bad but then Vienna never was, it was just a slightly pointless spin-off and that same no reason to be there vibe is what I got from this thirty-minutes. It all comes to ahead with Bernice Summerfield in The Phantom Wreck. The story is nicely continuity free, set during the early years of the range when she worked for the university. It is a pretty standard haunting story but it isn't scary or tense enough, which I would have liked more of.